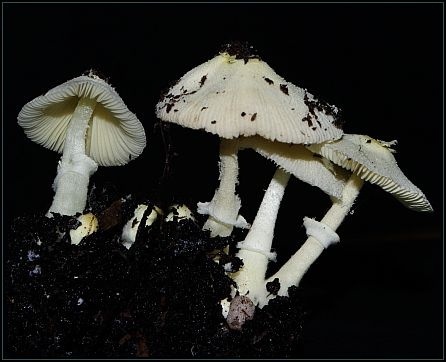 Description: Medium to small sized delicate agaric, fasciculate on compost heap. Pileus: Conical to flat with a central umbo, pale yellow with a darker yellow brown umbo - remnants of the velum, flocculose, dry, striated to ¾ of cap, flesh thin; 14-18mm diameter. 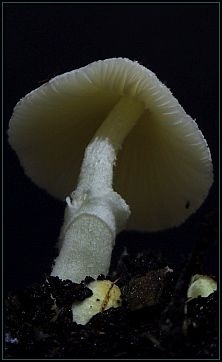 Stipe: Pale yellow, subbulbous at base, with sheating loose ring lower to central, hollow, pruinose; about 1.5-3mm diameter. 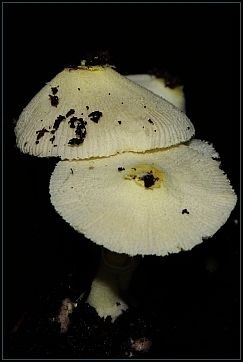 Gills: Free, close, pale yellow. 10% Ammonia: On gills - no colour change. 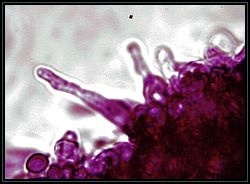 Cheilocystidia: Present, cylindrical (19-37µm x 2.5-4.0µm; base thicker 6-7µm). 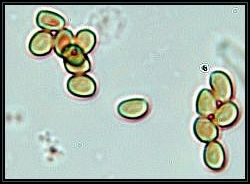 Spores: Elipsoid to almost rounded, small, smooth without germ pore, inamyloid; L=5.0-6.2µm; W=4.1-4.9µm; Q=1.14-1.46, Qm=1.27.